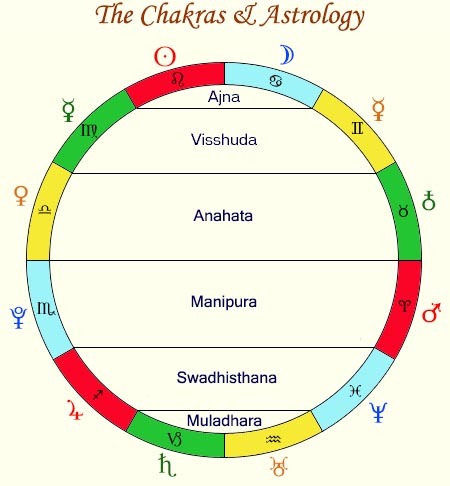 This diagram represents how the Chakra system can be mapped over the zodiac of astrology. This is an advanced topic, so take your time as you go through this subject (see the reference Chakras and Astrology by Ray Grasse). 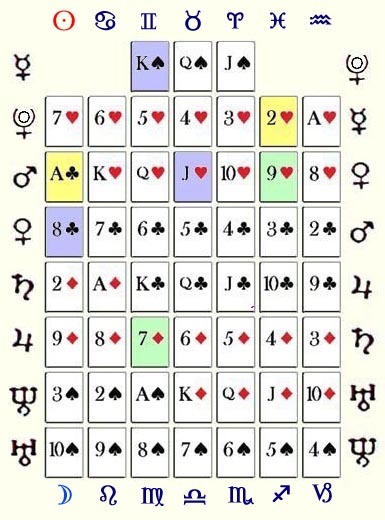 As has been stated previously, the system of the cards has always been closely associated with the language of the stars, or the language of astrology. Astrology is a symbolic language, and has been used as a means of describing cosmic man in relation to human being. The study of astrology is beyond the scope of this topic, but it would be best for any committed card reader to associate themselves with at least the basics of this essential science. The chakra system is another framework used to provide an understanding of the means by which universal energy interpenetrates the human being. This system was developed in the East, and has made a strong impact on the West since the early 1900's. The chakra system advances the concept of energy vortexes which are collection points within the subtle (etheric) body of humanity. These energy vortexes create the physical system associated with each chakra, emerging as a major organ or one of the endocrine glands. There is a whole section dedicated to The Chakras, so we will give just a general reference here. Now let's explore the diagram shown here. The zodiac is broken into its 12 signs, represented by the symbols present within each division. Outside of the circle, and next to each sign is the symbol for the planet that rules in that sign. The lines that go across the center of the circle represent the divisions of the chakras. You will notice that there are 5 lines, which creates 6 chakric states. One thing that you may notice is that here we are describing 6 chakras, when in the writings there is mention of the '7 major chakras'. Let's take a closer look at the way in which the chakras map over the Sun spread that we have been using. Using the diagram on the right, the 1st chakra is represented by the 1st column on the right (containing the in the Mercury row and the in the Neptune row). Each column to the left of this represents the next chakra until you get to the 7th column, where the planetary symbols of the Sun and Moon are present. The reason for this is that since the crown chakra (situated at the top of the head) is transcendental in nature, it does not correspond to the material plane in general, and is only experienced when one can raise the kundalini from the base of the spine (1st chakra) to the crown (7th chakra). At that point, one experiences enlightenment and the 7th chakra is activated. Therefore, since the 7th chakra is transcendental in nature, the presence of the Sun and the Moon there represent the ‘union of opposites’ as a fundamental principle of Spirit (Unity). As will be seen later, the outer planets of Pluto and Neptune play the role of these cosmic polarities as the 7th Chakra is cognized in 3D reality. Leaving aside the technicalities, you may notice right away the symmetry that is maintained in the mapping of the astrological signs over the Sun spread. The progression starts with Cancer atop the 6th chakra, going across to Aquarius. Then it loops around to Capricorn on the bottom going across to Leo. Lets use the 6th chakra to describe how the mapping of signs works in relation to the chakras. According to Paramahansa Yogananda the 6th (or brow) chakra is represented by the sun as its masculine part, and the moon as its feminine counterpart, which essentially describes the arrangement that is being presented here. So notice now that we have the planetary rulers that oversee each row, and we have chakra centers that are in effect for every column. With this we have the framework from which to do an actual reading. The reason that the planetary symbols are repeated--but rearranged--along the left of the diagram is an important subject, and is described more fully in the Planetary Pairs reference page. In short, according to Humanistic Astrology, the planetary symbols themselves can be analyzed as pairs of differing but complimenting energies. The last part of this topic regards the way in which a particular card can be read. When the card is being read from the point of view of the rising spread, use the planetary ruler on the right of the diagram, along with the sign along the bottom of the diagram. Likewise, when reading for the moon spread, use the planetary rulers on the left of the diagram along with the signs along the top. For example, when reading the rising energy for the , you will have Mercury as the planetary ruler, and Capricorn as the sign (in the 1st chakra). When reading the from the moon perspective, you have Pluto in Aquarius (still in the 1st chakra). Over the course of my research, I have made to an important realization regarding the use of astrology when doing a reading. I have come to find that Humanistic Astrology is by far the most advanced form of science to use for readings. Please read some of the works of Dane Rudhyar and Michael R. Meyer to get familiar with this exceptional astrological science. Please see our Links page for references to support these findings.